It was Mothers’ Day on Sunday morning and the Catroville Mansion was extremely quiet without the routine noise of Mama Patti Ball making breakfast for her kids. Suddenly, at about 8:30 pm, a shrill scream came from the kitchen. “Argggghhhhhhhhhh!” shouted Cleocatra as she saw Papa Adam Ball sprawled on the floor with a small pool of blood around his head. Upon hearing the scream, the three brothers, Mika, Tonto and Ruddy rushed to the scene to see what had made their sister so terrified. Tonto immediately took out his cell phone and called for an ambulance. 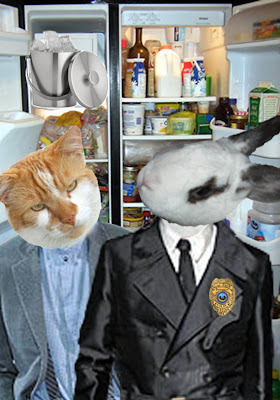 He also called Detective Bucky Bun from CCSI headquarters to come over immediately. While Tonto was on the phone, Mika and Ruddy quickly rushed to their Papa and found that he was knocked unconscious. The boys looked around but found no trace of any weapons. There was only a pool of water with some big paw prints leading to the backdoor. The whole kitchen was in a mess with all the cabinet doors open. 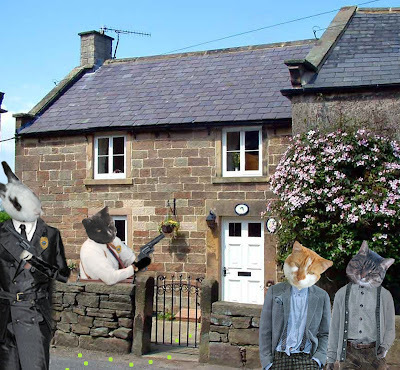 Some cans of tuna, a frozen mackerel, a packet of peas and some cream cheese were found missing from the house. Mama Patti Ball was also missing. They searched the house but she was nowhere in sight. “Someone might have catnapped her!” cried a panicked Ruddy. The ambulance arrived shortly. Two paramedics came in and inspected Papa Adam. “Can we have some breathing space please,” said Paramedic #1. “His pulse is fine. We’ll take him back to the hospital for further tests,” said Paramedic #2. 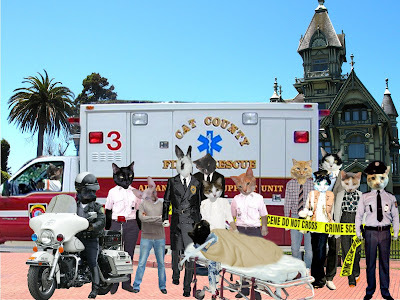 They then carried Papa Adam carefully into the ambulance and drove off accompanied by Cleocatra and Ruddy. 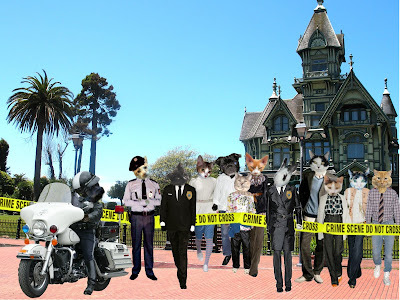 Detective Bucky Bun, together with his assistant Detective Harry Moe arrived a few minutes before the ambulance was about to leave. There were already some neighbors curiously gathering around the mansion to see what had happened. 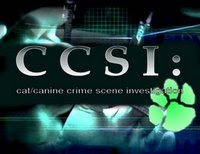 Two policemen were seen putting up the CCSI tapes around the mansion. “Miss, can you move away from the barrier?” asked Policeman #1. “Mister! Would you stand further a bit? We are doing some serious investigations here!” said Policeman #2. 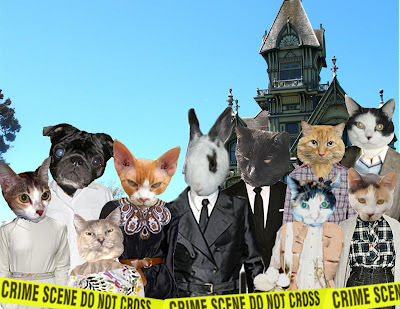 Inside the mansion, Detective Bucky Bun was finding proof on the attempted murder and catnap motives. 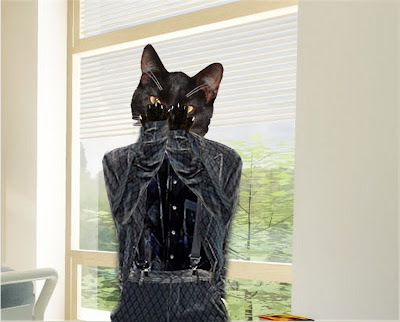 He checked on the back door and found that there were not any break-in traces while Detective Harry Moe was seen dusting for more paw prints. 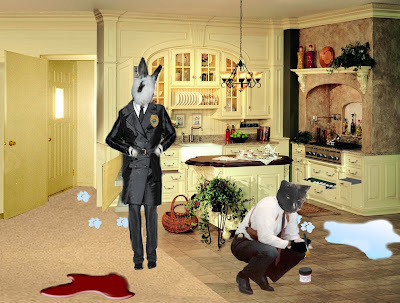 “I think the suspect knew Mama Patti,” Detective Bucky Bun said while inspecting Papa Adam’s blood. “Hmm… This is still fresh. The incident must have happened barely two hours ago. What is this pool of water doing here?,” wondered the detective, "It's cold." He then checked the freezer and found that there was a full bucket of ice cubes. “Did your Mama always prepare so much of ice?” he asked Mika. “Well, unless she is planning for a gathering, which is not possible as none of us were informed at all,” Mika replied. “I see. Let me check with the neighbors if they had seen anything,” replied Detective Bucky Bun. There were so many onlookers outside waiting to give their statements. “When I opened up my windows this morning at 5 am, I saw Mama Patti running towards the west side area. 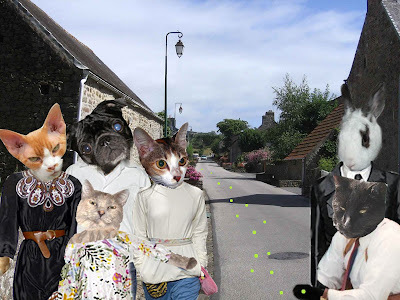 I saw a big hairy cat chasing after her with a big bag in his paws. He behaved very mysteriously,” said neighbor Ling Ling. “I got up at 6:30 am for my usual morning walk and saw a dark figure running out from the backdoor. He was really huge. I thought I saw something glittering in his paws. It looked like something square,” said Mr. Doogle. “What happened dear?” asked Mrs. Peachy Pitt. “Someone left some peas on the road!” answered the crying girl. Detective Bucky Bun’s eyes were suddenly wide open. “Where did this happen?” he asked. The girl pointed at the west side of the road and told the detective that there were peas all over the pavement. The guys immediately rushed to the scene. “I see lots of peas here,” said Detective Bucky Bun. “It looked as if the attacker had left a trail here and it is moving towards that direction.” He pointed to the peas laying all over the road, trailing towards the other end of the west side area. The detective and the boys followed the trail and it led to someplace very familiar. They could even smell the cooking of buttered Mackerel from outside the house. Both detectives pulled out their guns not knowing how Uncle Bill was involved with this crime. 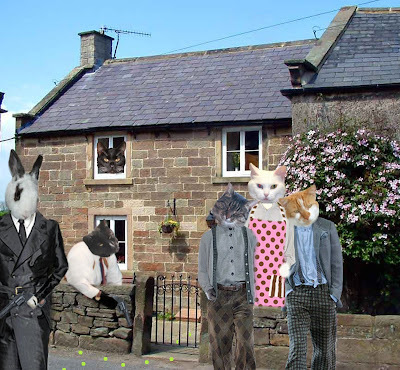 The boys approached the front door and as they were about to ring the doorbell they saw a familiar face. To their joy it was their Mama! “Boys! How did you manage to find me over here? I was making you a surprise brunch for our family,” said a shocked Mama Patti. The boys immediately ran over to hug their Mama as they were so relieved that she was safe. As they were explaining to Mama Patti and Uncle Bill what had just happened, the phone rang. 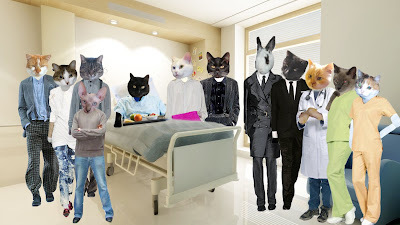 Detective Bucky Bun immediately brought them to the hospital. 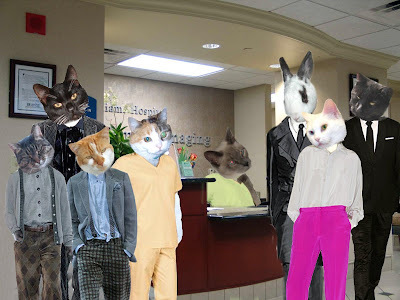 When they reached the hospital, they rushed to the reception counter and asked for the ward number. “Room 108,” replied the nurse behind the counter. As they arrived outside of the room Papa was staying in they saw Doctor Kieran and asked him to find out how Papa was doing. “Don’t worry, your Papa is fine now. He can check out anytime he wants,” said the doctor. The doctor also went on to explain that Papa Adam had been in a slight shock when he arrived at the hospital but that he was OK now. 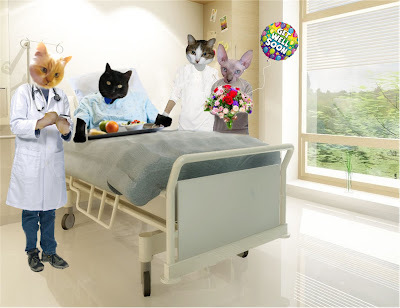 Everyone visited with Papa after talking with the doctor and asked Papa what had happened. “I heard some noises coming from the kitchen and went down to investigate. I skidded on something which I think was an ice cube and banged my head onto the floor. Before I knew it, I was out.” , Papa explained. “It’s not your fault at all, Bill. If I had remembered to take all the ingredients with me when I came over to your place to cook you wouldn't have had to go back to my place to collect them for me. Don’t be so hard on yourself no one is at fault,” remarked Mama Patti. “Hey, I’m fine now. Accidents do happen. This is not something that anyone would want to have happened. You are forgiven Bill. Can I go home now? I’m hungry and I don’t want to spend Mothers’ Day in a hospital,” said Papa Adam laughingly. “Ok guys! Let’s head home. I will still need to finish cooking the Seafood Fettuccini I meant to surprise you guys with,” said Mama Patti, and invited all who were in the hospital room to join in the meal with the family. 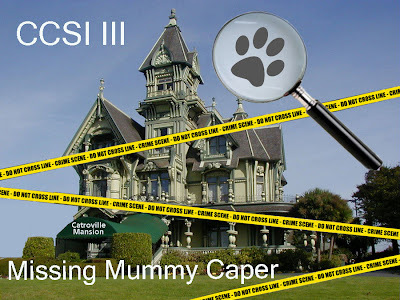 The case of the missing mummy has been declared closed. No one was murdered. Everything that had happened was just Uncle Bill trying to help Mama out and the good intention of Mama Patti to surprise everyone on Mothers’ Day. 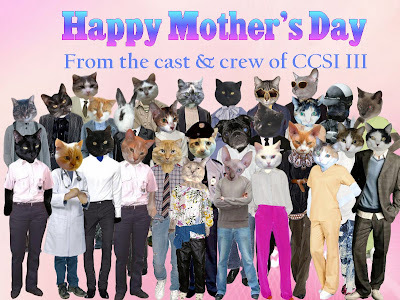 To all the Mothers – I hope you have all the love and care during this season as the Ball Family, Cast, Crew, and The Executives of Little Productions. *Story and characters are entirely fictional and any similarity with existing imaginary figures are absolutely intended. On mother's day the Ball kids find out that their Mom is missing! 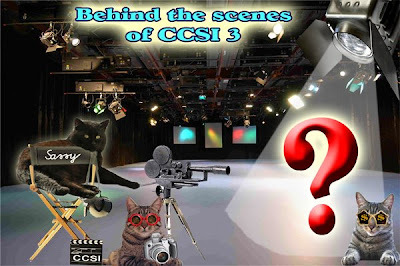 Emil was able to secretly shoot some exciting footage of stuff that was going on behind the scenes of CCSI 3. He tells us that ALL actors did nasty things they shouldn't do - only some were lucky enough to not be caught by his camera. Who were the unlucky ones that got caught? For a small donation Little Prodcutions will email you the compromising and revealing pictures. These pictures will never be published! This is your ONLY chance to satisfy your curiosity! 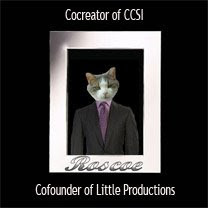 All money (minus Paypal fees) will be donated to Cat Friends Helping Friends. Which benefits you. And you. And all of us!! !